Toast Message is an application that pops up all messages on the surface of the device screen. With Toast Message, all the incoming EMAIL, Text Message (SMS), or PIN messages will directly pop-up and appears on your screen by showing sender name, subject title, and full content of message. Of course, the Toast Message is fully customizable based on your own styles. Toast message includes different amazing themes selection of the pop-up message window such as Blue Sky, Flower, Love, Nature, Old Brown Paper, Soft Yellow, and other style of themes. Besides that, it also has time control feature that allows you to define the display time of the pop up message. 1. 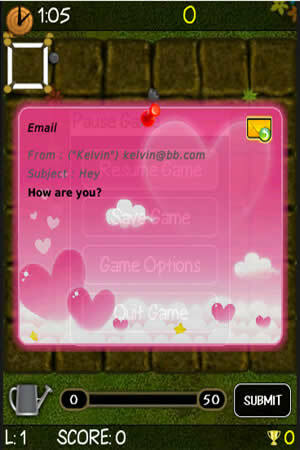 Pop up all Text Message (SMS), Email, and PIN Messages on the device screen. 2. Display messages that show sender name, subject title, and full content of message, or only show the sender name. 3. Provide different amazing & pretty themes to customize based on your style pop up window. 4. Time control is available to set the display time of the pop up message. 9) Low memory and battery consumption. * For BlackBerry? Storm? and BlackBerry? Storm2?, please follow the below instructions to disable the compatibility mode to ensure the application displays properly. 2. Go to "Advanced Options"
4. Select the "Toast Message"
6. Click on "Disable Compatibility Mode"